Canadian toadflax (Linaria canadensis) is a native, annual, wildflower that grows to a height of about 20 inches. It is in the Plantaginaeae, or plantain family. Other common names for Canadian toadflax are blue toadflax, and oldfield toadflax. 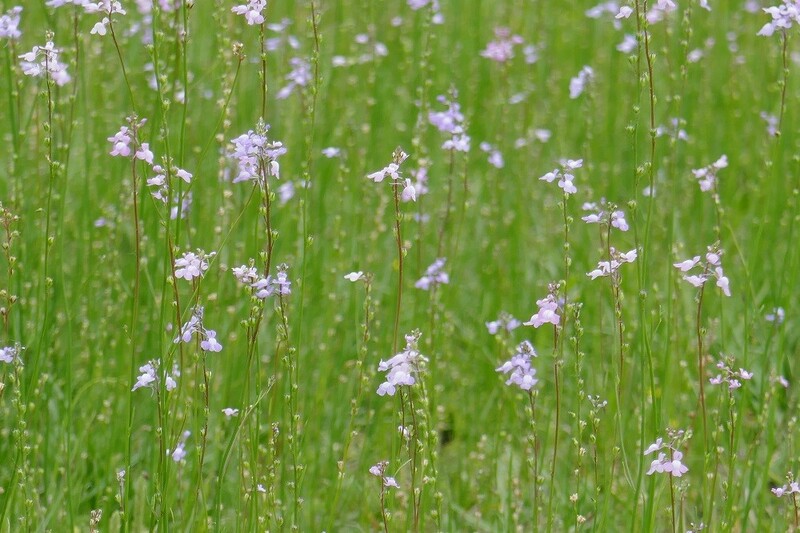 I occurs naturally in disturbed sites, meadows, fields, pastures, and roadsides. In the home landscape it can be grown in natural areas or areas of lawn that are mowed seasonally. It grows best in full sun with slightly moist roots, but will grow in part shade with drier soils. Occasionally it can be found growing singly, or in small clusters of plants, along sidewalks, in flower pots, or in the lawn where previous plants had grown or seeds were dropped. Mowing in the late spring, when the plants seed heads are brown, will help to disperse the seeds and supply seeds for next year’s crop of toadflax. 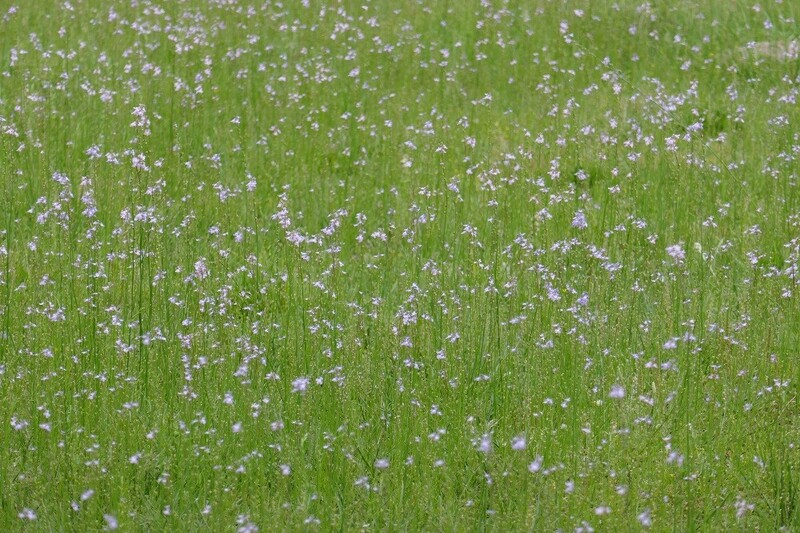 If you mow after the spring wildflowers have bloomed remember to mow so the seeds are blown, from the mower, into the areas you want new plants … not into paths or garden beds. I generally mow outwards in to keep my flower beds less weedy and keep the wildflower areas full of fresh seeds. The leaves appear on the main stalk of this wildflower and are alternate and linear and rather sparse. Occasionally a plant will overwinter, and grow old enough, to produce a basal leaf cluster whose leaves are opposite in rosettes. The stems have fewer and fewer leaves along the stem as it reaches upwards towards the flowers. 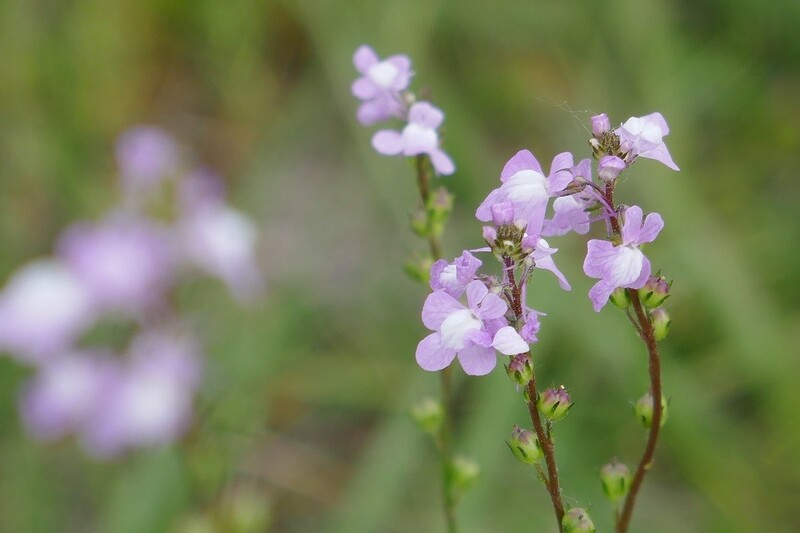 Canadian toadflax blooms are two lipped, bluish-purple flowers, with the lower lip and throat having white patches. The flowers are 8 – 11 mm long. The flowers are born on racemes with lower blooms opening first. The flowers are used as a nectar source for many small pollinators such as bees and flies. The seeds are contained in tiny upright vessels that keep them from tipping out unless a strong wind or animal comes along. 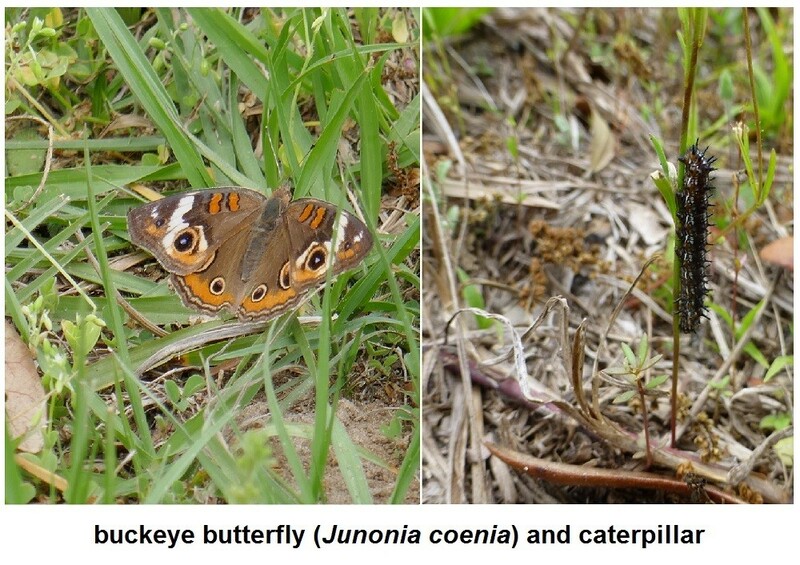 Toadflax is a host plant for the buckeye butterfly. It takes quite a few individual toadflax plants to provide enough vegetation to support one caterpillar because they are quite spindly without many leaves and as the season progresses, and the plant dies, they become even more spindly. 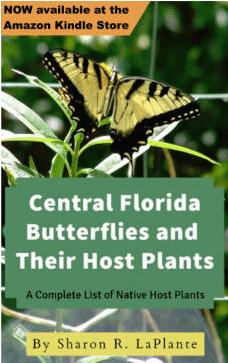 Generally the caterpillars resort to eating the outer layer of the stems in order to gain enough size to pupate. Propagation is achieved through the germination of seeds. It is best direct sown into the area it is going to be allowed to grow in naturally rather than grown in pots and transplanted out. Direct sow seeds in the fall so that they may overwinter and gain natural cold stratification.